UWP Series UHF synthesized wireless microphone system. 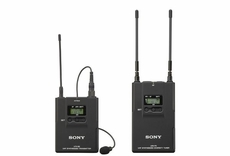 Package includes a lavalier microphone, bodypack transmitter and portable diversity tuner. Mounting adapter for camcorder included. Channels 30 to 33. The UWP-V1 includes extremely robust metal construction, mic/line input selection on the bodypack transmitter, a miniature metal body omni-directional microphone and plus the receiver includes a convenient auto channel scanning function allowing automatic search for unoccupied channels. UWP Series transmitters and receivers can also be purchased separately (see optional accessories for details). Space Diversity Reception System : Typically, wireless microphone transmission systems can be subject to reception interruptions (signal dropout), but UWP series tuners reduce this to a minimum. By utilizing a space-diversity reception system, it achieves stable reception by using dual-antenna inputs/reception circuits. These receive signals over two different paths and automatically select the stronger RF signal for output. 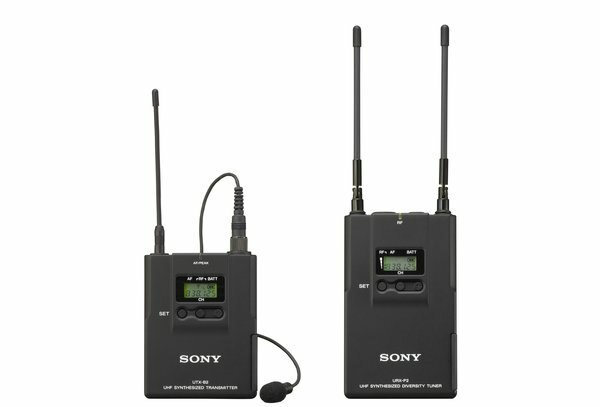 Simultaneous Multi-Channel Operation :	Simultaneous operation of up to 16 wireless microphones. Optimum combinations of practically tested, interference-free frequencies are stored in the tuner. By using the pre-programmed frequency groups, users can easily choose interference-free frequencies for the transmitters and tuners, simplifying the task of system setup.